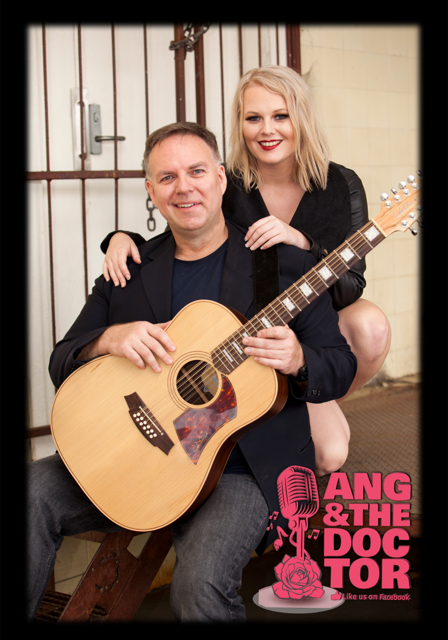 Ang & The Doctor can perform in acoustic mode, with backing tracks, or a mixture of both. With an incredible repertoire of songs and the ability to mix up styles at will, this is one duo that can provide exactly what your venue or function requires. Ang is an exceptional singer with international touring experience, having performed throughout Indonesia and China, in addition to performing across Australia. She is influenced and inspired by Suze Demarchi (Baby Animals), Amy Winehouse. Stevie Nicks and Sheryl Crow, yet with a texture and style all her own. Ang is also a very gifted instrumentalist, having performed with both the Sydney Youth Orchestra and Australian Youth Orchestra. Scott is a highly experienced guitarist, having toured extensively up and down the east coast of Australia, appearing everywhere from backyard weddings to national TV and major music festivals performing in front of tens of thousands of people. As a professional guitarist he has played rock, pop, jazz, blues, country, classical, funk and ska, recorded on numerous projects and composed music for film and television. Scott has shared the stage with musicians from some of our country’s biggest bands and been acknowledged as one of the finest guitarists in Australia.